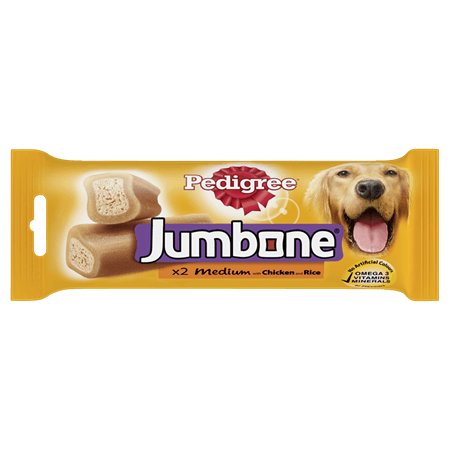 Pedigree Jumbone ® Medium With Chicken and Rice is rated 5.0 out of 5 by 1. Rated 5 out of 5 by Katie from My dogs favourite treats I regularly purchase these for my french bulldog to keep her entertained whilst I'm doing things around the house! She loves them!! Medium dogs (10-15kg), feed up to 1 chew per week. Medium dogs (15-25kg), feed up to 1 chew per week. Large dogs (25 kg and above), feed up to 2 chews per week. Each chew provides 9% of the weekly energy requirements of a 10 kg dog. Please reduce main meal accordingly. Not suitable for dogs under 10 kg or puppies under the age of 9 months. Use within 14 days of opening. Fresh drinking water should always be available.